The classic design of this single sink vanity base is enhanced with the arched framework within the double door cabinet front and the beautifully wood turned feet. 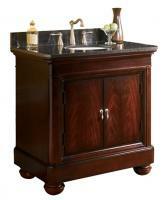 The brown finish has a rich warm tone that high lights the natural design of the wood material. A single drawer at the bottom adds even more wonderful functionality for storing small items in the bathroom. A black galaxy granite counter top surrounds the under mount white ceramic sink. 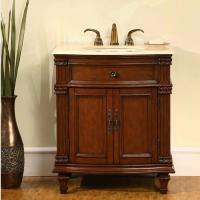 At three feet in height, this piece will make the perfect addition to many styles of bathroom décor. 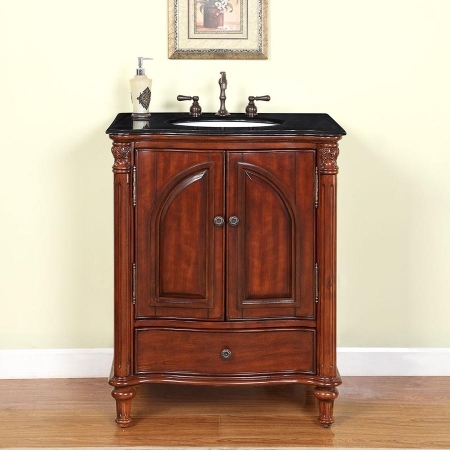 The styling of this vanity will be appreciated for many years to come.